Newel Posts for interior stairs are not all created equal. Please do your research before you buy. The primary difference is found in posts with a panel design in all four sides, such as a flat panel box posts, and raised panel box posts. Many manufacturers do it the cheap and easy way, by just routing out a design in the side of the post. Conversely, the only box newels we have ever offered are built using true stile and rail construction, just like a quality interior hardwood door is constructed. At Custom Hardwoods, we would never sell you a product we wouldn't put in our own home. 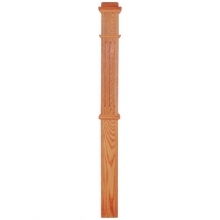 The popularity of this particular style stair post has risen a great deal in recent years for two reasons. The first is that the cost has been lowered dramaticaly. High end stair posts such as ours cost three times as much ten years ago. The price reduction is primarily a result of the huge demand for large mission style posts in recent years, which has forced all manufacturers to streamline production methods, rather than build two newels at a time. The second relates to the the huge popularity of iron balusters in the stair world today. Before the iron baluster craze, you would buy a wood stair post and a wood baluster to match that stair post profile. When iron gets tossed in the mix, it really shuffles the deck because any wood post looks good with wrought iron. Therefore, if you are not painted in a corner, and can go with anything you like, most homeowners will choose a square stair post, be it 3 inchs wide or a monster 8 or even 10 inches wide. A less common, but very impressive option are iron newel posts which still use wood handrail and wood handrail fittings. Red oak, poplar, hard maple, and american cherry box newels are in stock for quick ship. 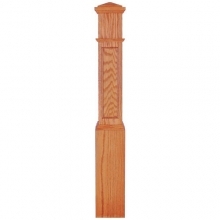 Some box newel posts are in stock in brazilian cherry. White oak, soft maple, african mahogany, santos mahogany, lyptus, walnut, hickory, ash, birch, white pine, yellow pine, alder and antique heart pine, have a 2 week lead time to manufacture. We feel privileged indeed to serve our existing and new customers. We look forward to creating a long, lasting, and satisfying working relationship with you.